We bought a pressure canner! Canning is a venture that my husband and I had long talked about but never did anything about. I have fantastic memories of helping my mom can peaches and cherries and antipasto when I was a kid. (mmm, home canned peaches!). Getting the canner was more my husband's doing than mine. He really is searching for a great tomato sauce. And he wants to can it. Last week we went to a local farm and got a bushel of roma tomatoes. He used half of them to make a large amount of tomato sauce with the intent to can. He was disappointed with the recipe and decided to freeze his sauce, rather than canning. 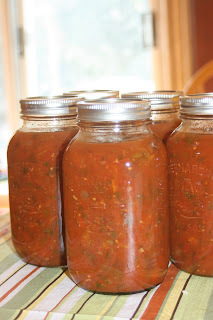 I happened upon a salsa recipe at one of my favorite blogs, Mennonite Girls Can Cook. I figured that the recipe would be a keeper because I grew up in a town full of Mennonites. I know they really can cook. I've bought their baking and canning at local events. Delicious. This salsa was too. It is a mild salsa and now that I know I can make it, I know I can play with it a bit for next time to turn up the heat. The recipe originally called for water bath canning, but I pressure canned it as pressure canning is a much safer form of canning (no need to make anyone sick on my first canning venture!). I'm really excited about this and look forward to other kinds of canning in the future. Ladle into (sterilized) jars, using canning funnel, cover with lids and screw rings. I've only ever canned jams and jellies before. Maybe someday I'll get brave enough to try a pressure cooker. I did this the past years but this year I don't know it seems that time is passing so fast and with so many things to do, I do not have the time to do it. It is great because you have tomato sauce all winter. I've never heard of a pressure canner before. I've canned only a couple times using the boiling method and it's a lot of work. Your salsa look good too! I've never canned anything before. Your salsa sounds delicious. Wow, that looks super. You're going to be so glad you have all that salsa! wooww!! Now that's REAL tomato sauce right there!! yuuummm all I'm thinking of is some pasta with that hehehe.